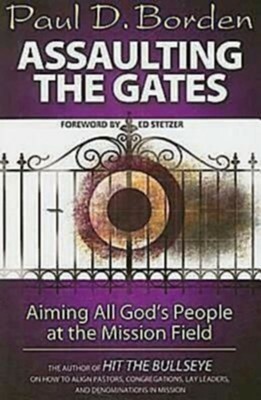 Any churches want to make the transition form an inward to an outward focus, from catering to the needs of members to reaching out into the world to make disciples of Jesus Christ. Too often they try to accomplish this radical change by taking half steps and particle measures, initiating a new program here or adding new staff members there. Yet this kind of change requires more. To succeed in changing its core focus this way, a congregation must learn strategic thinking; it must commit itself to seeing the big picture and to taking the steps necessary to paint that picture afresh. Everyone-including pastors, lay leaders, key teams and groups, the whole congregation, and its judicatory or denomination-must be involved in a process of transformation. 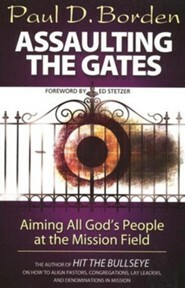 Paul Borden, author of Hit the Bullseye and Direct hit knows that this transformation will not be easy. But if the target is brining more people into saving relationship with Jesus Christ, what could be more worthwhile. Learn the Big Picture approach that will aim your congregation at the mission field in your back yard, or around the world. Many churches want to make the transition from an inward to an outward focus, from catering to the needs of members to reaching out into the world to make disciples of Jesus Christ. Too often they try to accomplish this radical change by taking half steps and partial measures, initiating a new program here or adding a new staff members there. 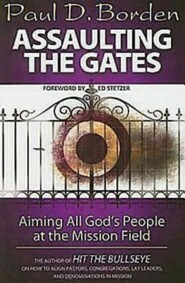 I'm the author/artist and I want to review Assaulting the Gates: Aiming All God's People at the Mission Field - eBook.